Penn’s Grove Middle School teachers nominate Students of the Month for each grade level based on their academic achievements and participation in class and school activities. 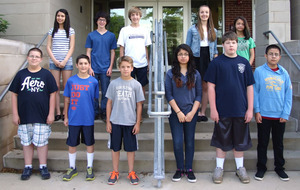 Penn’s Grove Middle School seventh grade Students of the Month for May are (front from left) Cody LaForte, Noah Hewes, Caleb Meyers, Guadalupe Olvera-Aguilera, Ray Conneen and Saul Fonseca Davalos; top (from left), Karen Villalobos, Tom Harris, Evan Campbell, Alexis Droz and Kaliah Rubincan. Tyree Larry is not pictured. 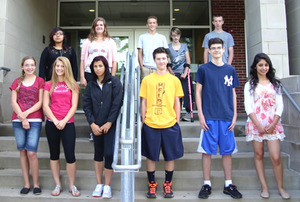 Penn’s Grove Middle School eighth grade Students of the Month for May are (front, from left) Allison Smoker, Corinn Schaible, Natalia Vazquez-Santiago, Matt Hale, Kyle Brennan and Maria Torres; top (from left) Tania Pina-Pina, Amanda Walton, Brad Henry, Chesapeake Wood and Will Chester. Joanne Herr is not pictured.